Light and fresh, but not lacking in flavor, Spring Vegetable Pizza has a lemon, basil ricotta base. Topped with fresh vegetables of the season, this is a delicious pizza as the weather warms up. There are 2 things you’ll notice about this pizza, 1: there’s no tomato sauce and 2: there’s no mozzarella. If you’ve been to Italy, you’ll know that they do their pizza (and pasta) using simple, fresh ingredients without over-saucing and over cheesing. The Italians let the freshness of the ingredients speak for themselves, and that’s what I’m achieving here. The base of the pizza is fresh ricotta with added lemon zest for a bright, fresh flavor. We all have our favorite pizza place that we like to go to or get delivered, but there’s nothing like making your own. It’s hard to get that pizza oven crust at home, so I bought a pizza stone. Now the question was, how do I get my beautifully topped pizza safely onto the pizza stone? After a little research, I found a tip of rolling the dough out onto a sheet of parchment paper and after topping the pizza, I used the paper to carry the pizza to the stone and it worked! After 5 minutes in the oven, the crust is set enough to be able to slide the paper out from under it. The dough recipe makes 24 ounces which makes 2, 13 inch pizzas. I like to freeze the other half of the dough so I know I always have some ready to go when the pizza urge strikes. Which is more often than not and since this is a relatively healthy pizza, feel free to indulge whenever you like. What veggies go on a veggie pizza? Quick answer, anything you want. Depending on what time of the year it is, you can top the pizza with any of your favorite veggies that are in season. 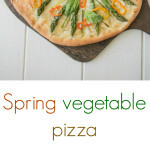 If you’ve tried this Spring Vegetable Pizza or any other recipe on the blog then don’t forget to rate the recipe and let me know how it turned out in the comments below. I love to hear from my readers! Spring vegetable pizza has a lemon, basil ricotta, asparagus, spring onions and sweet peppers. Divide the dough into 2 balls. Cover and allow to rest for 20 minutes. You can freeze the other ball for the future. Position oven rack about 4-5 inches from the top of the oven and preheat a pizza stone and the oven to 450°F/232°C. To a mixing bowl add the ricotta, lemon zest, Parmesan cheese, salt and pepper. Mix well and set aside. Spread the ricotta evenly over the dough, leaving a 1 inch border. Arrange the vegetables and top with a little grated parmesan cheese. Use the parchment paper to transfer the pizza to the stone and bake for 5 minutes. After 5 minutes slide the parchment out from under the stone and rotate the pizza, bake for a further 5 minutes. I could eat pizza everyday and could probably get away with it if I ate more healthy pizzas like this one. I “stumbled” your post. Oh, I absolutely love the sound of this pizza! No doubt, spring is here!! I am a total sucker for pizza and this one with the vegetables is such a healthy choice! How pretty is this! It’s a work of art – I’d not want to cut it to eat it! I love the way you topped this beauty. Thanks for the tip on the dough and pizza stone. I always wondered about that! Now I’m all set for spring pizza! What a gorgeous pizza! I can just imagine making this with all kinds of veggies from the farmers’ markets! This is totally the way I love to have a pizza, fresh and meatless, YUM!! I just got a beautiful bunch of pencil thin asparagus in my “Farm Fresh” box yesterday. This is so beautiful I can’t wait to use them in this way. I love my pizza stone. In fact, we have two here now. One for Dan’s pizza and one for mine, that way his pepperoni doesn’t get on my pizza. I love the trick about the parchment paper! And, the toppings on this totally call to me. I love ricotta on my pizza, and to be honest, I don’t really care for sauce on my pizza. Weird, I know. This looks wonderful! 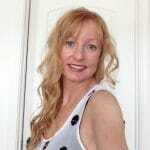 Oh, Janette, this is just absolutely gorgeous! Bursting with brilliant (and healthy!) spring flavors! Such a great recipe, and I really liked your suggestion of freezing part of the dough so you always have some on hand! Your pizza is a work of art! Beautiful!!! A simple and delicious looking pizza! Cant wait to give this a try! Well, this is the best-looking pizza I’ve seen in a long while, Janette! I love that you’ve given it such a strong spring theme, and that ricotta base topping… mmm! Yay! I’m so glad you got a pizza stone! And you’re so right, there’s nothing like making your own pizza at home! I’m not a huge of overly sauced pizzas so I really like the ricotta base you’ve created. And the seasonal veggies – perfecto! Love homemade pizza and I also love using my pizza stone! This looks gorgeous! Perfect for Spring!